Bath Iron Works' dry dock floats on the Kennebec River on Tuesday in Bath. 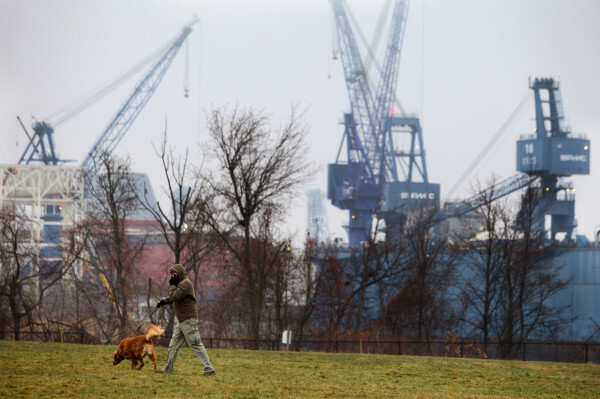 A man walks a dog on Tuesday in Bath's South End Park on Washington Street with the cranes of Bath Iron Works seen in the distance. 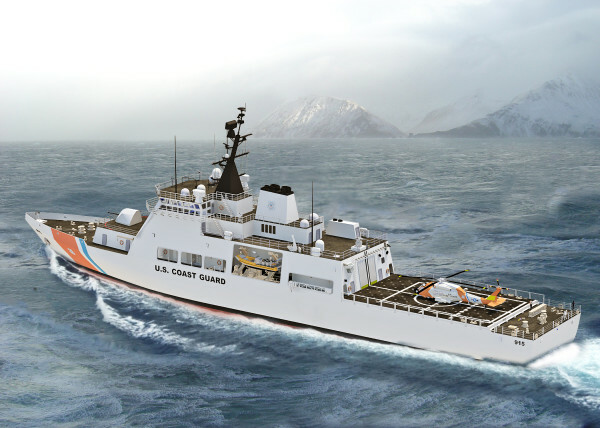 This digital image, distributed by BIW, depicts a proposed U.S. Coast Guard ship the Bath-based company hopes to win a contract to produce. Sen. Susan Collins toured the future USS Zumwalt, the first of three DDG 1000 stealth destroyers to be built at Bath Iron Works in this 2014 BDN file photo. Prior to the tour, union leadership presented her with letters signed by thousands of BIW employees thanking her for her work securing funding for future BIW work. BATH, Maine — The Maine shipyard building three of the Navy’s largest and most complex destroyers faces a complexity of its own: What comes next? Bath Iron Works will enter major bidding competitions in the next two years that company officials have said the yard must win to keep up employment amid decreased demand from the Navy for the large surface combatants that have kept thousands of Maine shipbuilders on the job for decades. The business concern is that losing any work makes getting future work harder. As a result, the company is starting to ask more from its employees, according to BIW President Fred Harris. “We’re not going to pay people less, but we need to do more per hour than we’ve done,” Harris said. For years, Bath Iron Works and its advocates, most notably Maine’s congressional delegation, have succeeded in persuading Navy leaders that the quality of ships built in Bath supersedes the higher costs connected with construction in a cold-weather, northeastern shipyard. But Harris and defense analysts interviewed by the Bangor Daily News said that quality comes up against the Navy’s strict financial pressures. “The Navy is trying to find ways to cut costs on every ship program that’s out there and in part it’s because the Navy hasn’t been great at containing costs,” said Jay Korman, senior Navy analyst with the Washington, D.C.-based consulting firm The Avascent Group. Congress has placed limits on the Navy budget until at least 2021 and big questions ahead for its budget in 2020, when it starts in on a $100 billion ballistic submarine program at General Dynamics Connecticut subsidiary, Electric Boat. With cost an increasing focus, BIW officials are concerned about getting underbid for work that could mean losing skilled employees and having fewer contracts, meaning each contract would include a larger share of overhead costs, such as snow removal, among other things. Either circumstance would dent the yard’s ability to compete for federal defense contracts. Harris said that’s where the company is in preparing its bid for a batch of offshore patrol cutters for the Coast Guard, providing work company officials said would avert laying off about 35 percent, or 1,200, of its manufacturing employees. The new customer will pose an even tougher challenge on cost, Thompson said. BIW cleared a design round to compete for the nine-ship deal against the small Florida-based Eastern Shipbuilding and the Louisiana-based Bollinger Shipyard, which in late 2008 beat BIW for $1.5 billion from the Coast Guard for its last batch of ships. Jay Wadleigh, president of Local S6 of the machinists union, the shipyard’s largest union, said he agrees that the shipyard will have to work on lowering its costs to compete on the Coast Guard bid and the next batch of Arleigh Burke-class destroyers in 2016. But how to cut costs could be the rub. With completion of a new outfitting hall later this year, just about all shipbuilding processes at BIW will occur indoors, and a new humidity-controlled paint facility will make blast and paint work more efficient. Those additions aim to chip away at the largest disadvantage of shipbuilding in Maine: the weather. “This is a great shipyard, but if it’s going to continue in the future, we have to work on being more productive and beating competition in the South and in the Gulf [of Mexico] and sometimes in other states, like Florida,” Harris said. Aboard the deck of the first Zumwalt-class destroyer, now in the Kennebec River, a few wooden structures that look like well-engineered smelt shacks provide shelter in some areas where workers pass from the deck to the interior of the ship. Despite adjustments for the weather, managements see outsourcing work as a way to reduce costs. Negotiations with the union over that prickly issue are expected to begin later this month. Korman, the Avascent analyst, said pressure to outsource comes from on high. “There’s a huge Pentagon pressure to stop the ‘make-it-ourselves’ mentality,” Korman said. The company has proposed buying some ship components from outside vendors, which Wadleigh said won’t save as much as the company projects. “We’ve found several miscalculations from the company, and their time studies have been very different than what we’ve come up with,” Wadleigh said earlier this week. Management’s cost-savings proposal started with some contention over whether buying from away would mean sourcing components from a General Dynamics subsidiary in Mexicali, Mexico, just across the border from the other shipyard Harris oversees in San Diego, the National Steel and Shipbuilding Co., or NASSCO. Wadleigh said the company “absolutely” planned to buy from the subsidiary in Mexico, until the union contacted Republican Sen. Susan Collins, who secured a promise from Harris that it would not deal with the plant in Mexico. In a joint statement to the Bangor Daily News, Collins and independent Sen. Angus King said cost is a real concern for the yard as they continue to work to secure federal funding for programs at BIW. Democratic 1st District Rep. Chellie Pingree said she believes there are other ways than outsourcing to cut costs. “I understand that there needs to be a focus on costs to win Coast Guard contracts, but I believe the skill and experience of those workers is the key to finding those cost efficiencies,” Pingree said. If union and company negotiators can’t agree on outsourcing, their respective cases will go to an independent arbitrator. And in 2016, the overall union labor contract is back up for negotiation. Harris said the about 5,700-employee company plans to continue hiring, largely to deal with between 200 and 300 shipyard workers expected to retire annually for the next few years. “I need to train those young people to do shipyard work, not what I can get done elsewhere by people who do it professionally all year-round,” Harris said, noting electrical cabinets are one item he’d like the yard to buy from an outside supplier. Since the summer, Harris has shared his outlook on the competition ahead with groups of about 150 BIW employees at a time. That includes the Navy’s plan to buy two Arleigh Burke-class destroyers per year for the next few years. It will bid on another multi-year contract for those ships in 2016, competing against the Pascagoula, Mississippi, shipyard of Huntington Ingalls Industries, which also builds ships for the Navy. While the trouble would still be years away, the lead time required in federal defense contracting makes 2020 the near future. That’s when work through the Zumwalt-class program — which was curtailed after three vessels because of cost concerns — will taper off and when the Navy will start spending heavily on a new batch of ballistic missile nuclear submarines, built by another General Dynamics subsidiary, Electric Boat in Connecticut, and Ingalls in Mississippi. 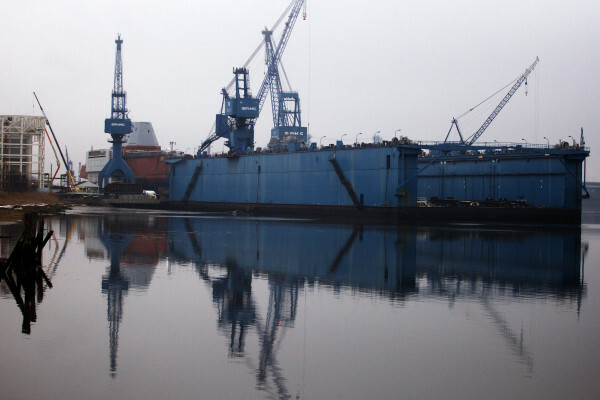 Korman said that the Bath shipyard’s quality and the strategic advantage as a second shipyard for the Navy at a time when China and Russia are building out their fleets makes the future workload for the yard not quite so dire. “It tells me that the programs that [General Dynamics] is involved in are going to be around for a long time,” Korman said.